Work smarter and drive better clinical, financial and operational outcomes with our top-of-the-line EHR. More Productive. More Profitable. Better Outcomes. Get all of the tools you need to deliver better patient care – from managing patient flow to ePrescribing – with our complete certified EHR. Charts, our EHR software, also integrates seamlessly with CareCloud Central, our practice management system, for a single clinical, administrative and financial solution. 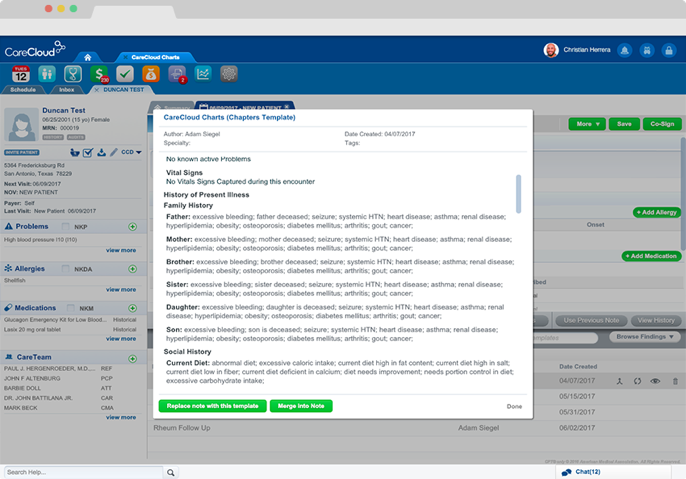 In addition to simplifying clinical handoffs, CareCloud also features patient engagement and clinical reporting tools that allow you to drive better patient outcomes. Take quicker, more intelligent action with critical, real-time patient information at the point of care. Expedite clinical encounters with flexible charting options, reusable order sets, and configurable templates. Easily share content and customizations from user to user to ensure quick and easy onboarding so your practice doesn’t miss any revenue. With Charts, you get a comprehensive, longitudinal overview of a patient’s complete clinical summary with exactly what you want to see – medications, problems, allergies, vitals, labs, immunizations and more. Obtain quick access to critical patient information anywhere on the chart with “Glance View,” which provides information in one single view based on user preference. 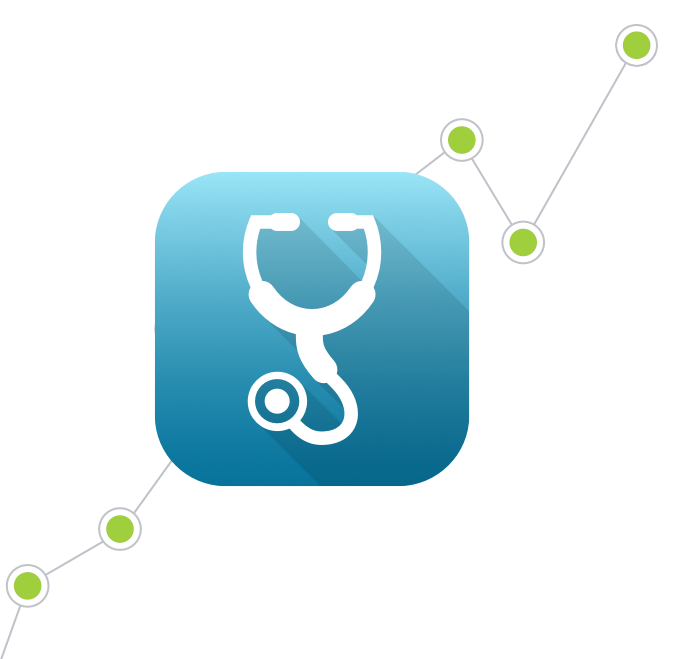 CareCloud Charts provides real-time intelligence to providers at the point of care. Our EHR delivers critical clinical decision support capabilities such as identifying drug interactions so you know you’re always prescribing the right medications, at the right time, to your patients. 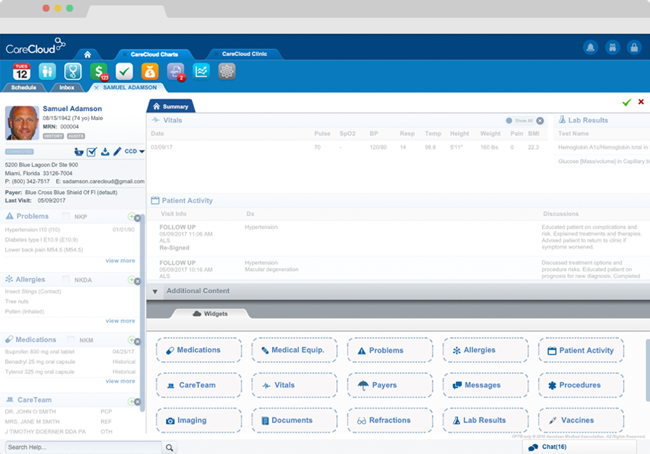 With predefined configurable templates and clinical content for dozens of specialties and subspecialties, you can document even faster and leverage best practices from your peers. 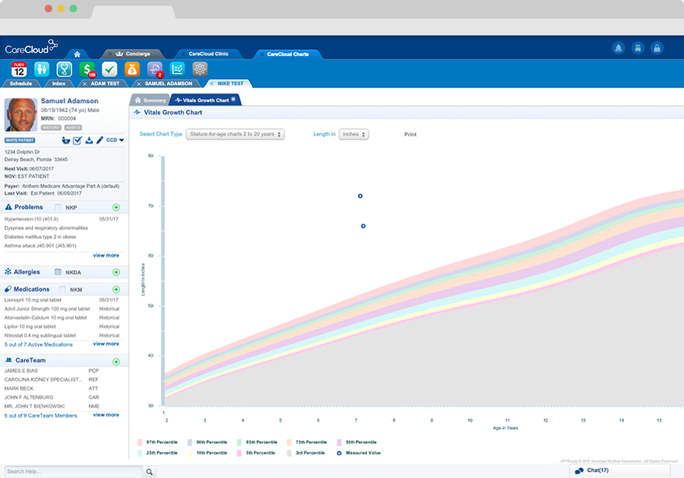 CareCloud Analytics gives you rich, detailed reporting capabilities to simplify quality initiative reporting, MACRA, and population health, and ensure you are successfully tracking toward your quality goals. CareCloud delivers exceptional support from the start. Our experienced Professional Services team can help your practice get trained on Charts quickly and easily, so you can start using your cloud-based EHR software to treat patients and meet quality objectives in less time than you thought possible. And after go-live, our highly-trained support staff is just a phone call away. 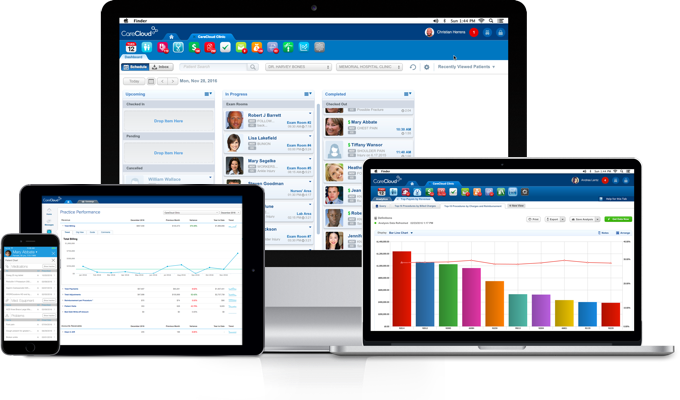 Charts provides configurable templates, integrated order sets, and flexible charting options to streamline patient encounters and a unified “inbox” to intelligently track and manage daily tasks to help providers work smarter, not harder. Charts features an integrated patient portal to securely engage patients in their own care plan. For doctors in a small practice setting, patient care is priority one. However, a host of financial and regulatory challenges are making it harder than ever for many practices to thrive. Along the way, bulky technology too often detracts from time with patients. CareCloud can help. Our easy-to-use, integrated practice management, electronic health record and revenue cycle solutions will help your practice to prosper, so you can focus on what matters most – caring for your patients. Declining reimbursements, rising costs, quality initiatives, regulatory requirements, and population health challenges put pressure on the profitability of many groups today — all while new payment models take hold. CareCloud’s integrated software and services are designed to help your large practice thrive in this turbulent healthcare world. Large medical groups leverage our innovative, scalable solutions to treat more patients, get paid faster, and stay ahead of change. Whether forming an ACO, switching to a pay-for-performance model, or looking to grow your business, CareCloud gives you the flexibility you need to succeed. 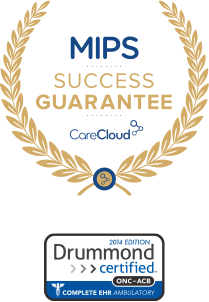 We’ve used CareCloud Charts to attest for Meaningful Use — a very easy process that has allowed us to reap significant rewards from government incentives. CareCloud Charts has been cutting my time down by a few hours every day. It’s going to be the difference between survival or not. It is a pleasure to work on the CareCloud system. This is the smartest system on the block. It has changed my thought process on EHRs. Office of William Kehne Moeller, M.D.